Sometime ago I wrote about the gargoyles that were located at Col. Walker Park on the +15 level of the future Telus Sky complex site. I suppose I could also say that I wrote about Art Central as well, since it was located adjoining the park and was at that time under demolition. As seen in the photo above, the gargoyles are no longer attached to the wall and the site is flattened in preparation for redevelopment. I can report that about two or three weeks ago, I happened to be travelling on the C-Train early one Monday morning when I noticed a scissor-lift was being moved into position to remove the gargoyles. I was working that entire day and the next. By the time was able to return to the site the gargoyles had been removed. It would appear my initial concerns that the gargoyles would be destroyed in the demolition of the building were unfounded. It would also appear that the gargoyles have been removed for safekeeping. Presumably we will see them again at some unknown time and place. For now it would appear that this chapter is now closed. 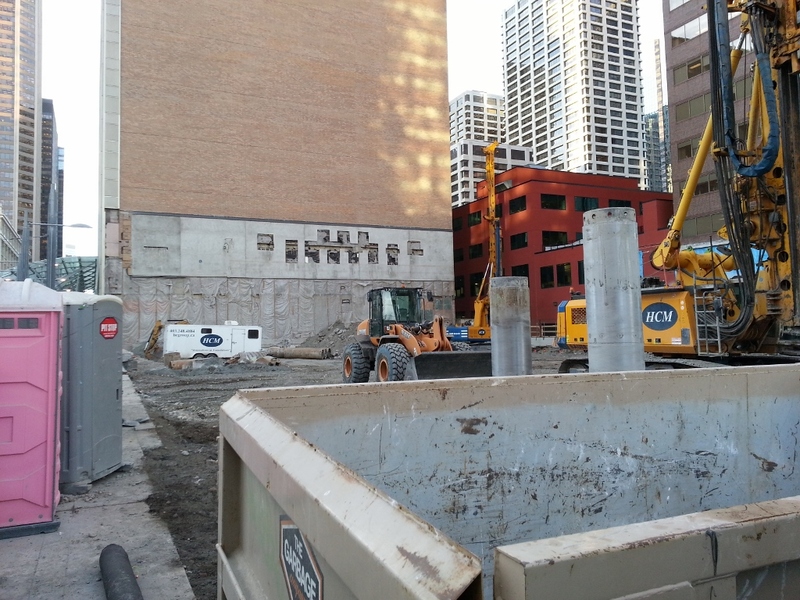 Art Central has been demolished, the art has been removed, and a new development will start to take its place. Advertising is an interesting field. But before I get talking about advertising, I want to talk about “pop-art” first. In the very near future we will be hearing much more about “pop-art” – not that we haven’t heard much before. That comment of course was somewhat tongue in cheek, as there was a recent sale (November 2014) of an Andy Warhol painting of Elvis Presley that sold for US $81.9-million. Primarily why we will be hearing more about this is because Yale University Press will be releasing a long-anticipated book tomorrow (January 6, 2015) – Thomas Crow’s book The Long March of Pop: Art, Music and Design, 1930-1995. In this book, there will be some discussion surrounding the placement of pop art in relation to folk art and music – especially in the USA. There will be further discussion on pop-art outside of the USA as well, in places such as the UK which is a very important place for discussion surrounding this art historical term. I think this will be a very interesting discussion to have and hopefully expand the dialogue further. There are currently two exhibitions of note, relating to “pop-art” that are currently on view elsewhere. I am sure that there are more than just two, however these two are located closest to Calgary, for those that are inclined to travel for business or personal pleasure. The Seattle Art Museum currently has an exhibition that talks about pop and its effect on artists that have produced or are currently working that takes pop art as a point of departure. It ends in little over a week from now. The Montreal Museum of Fine Arts (Musée des Beaux-Art de Montréal) currently has an exhibition of Andy Warhol`s advertising posters on view. As part of this exhibition two catalogue raisonnés have been produced – one dealing with Andy Warhol’s commissioned posters and the other his commissioned magazine work. I am sure that this would be a very interesting show to view as it probably covers a lot of ground that we don’t often see in a gallery exhibition. This show will continue until mid-March. This last show of course leads me into advertising – which ties in well with “pop-art” as a general rule. For this reason why I believe that the MMFA/MBAM show mentioned above would be so interesting to see. All businesses need to do some form of advertising if they want to stay in business. It is a fact of modern life. Having owned a few businesses myself, I understand the necessity to advertise and create publicity for the business (having worked in corporate public relations beforehand, it was an easy sell). On the other side of the equation, I also understand the futility and frustration that comes with it as well. It is a damned if you do, and damned if you don’t type of scenario. This is primarily because measuring advertising effectiveness involves highly subjective criteria. It this way, partly because of how difficult it is to effectively evaluate, quantify and measure value; and measure the sales efficacy of the advertising dollar. In many ways spending money on advertising is always a bit of a crap shoot trying to determine what is going to work most successfully, because the ground is always shifting and what worked in the past does not always work in the future. One of the oldest and most inexpensive forms of advertising is to simply place a sign outside of the business door – essentially to “hang out a shingle”. Normally there is not much creativity exercised in these type of things. Outside of the main signage which is attached to the building or storefront, there is the possibility of a sandwich board, maybe some signage in the window, or some other variation on one or both of these themes. It is usually pretty straight-forward. 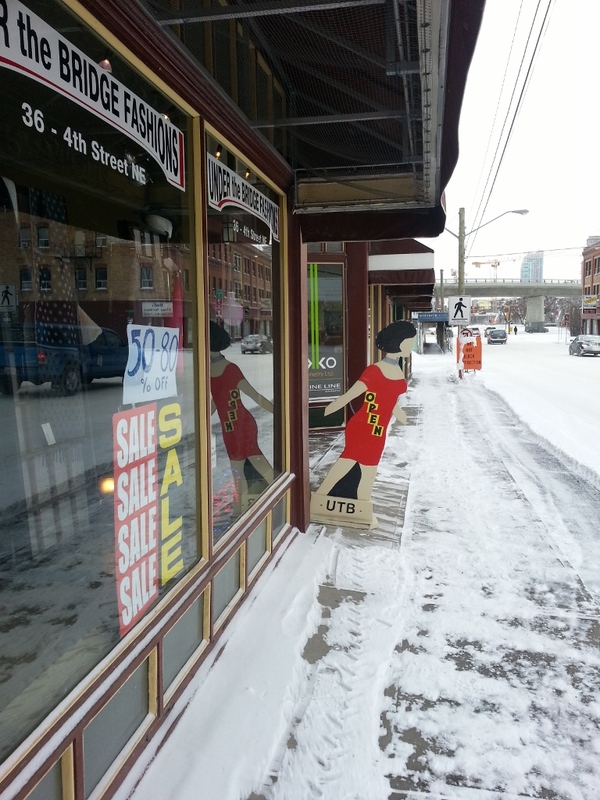 Yesterday, I walked past a piece of street advertising placed outside of a business door on Edmonton Trail. I have passed this sign which is illustrated at the top of the post before. I suspect that it has been standing outside the door of this business for a number of years. How long? I have no idea, but it has been there as long as I can remember in recent memory. 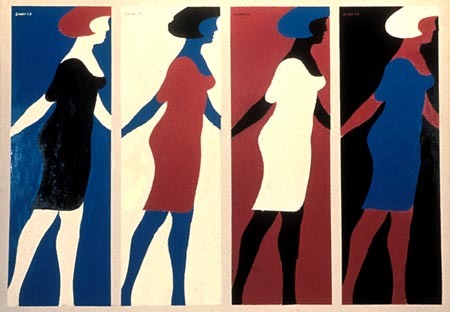 Every time I see it, I think of Michael Snow and his Walking Woman series of paintings, drawings and sculptures dating from the 1960s and 1970s (although I believe he may have done some in the 1980s as well, but not as frequently). They are iconic pieces of Canadian art history – drawing from both conceptual and pop roots in Toronto. The painting above is entitled Four, 1963. 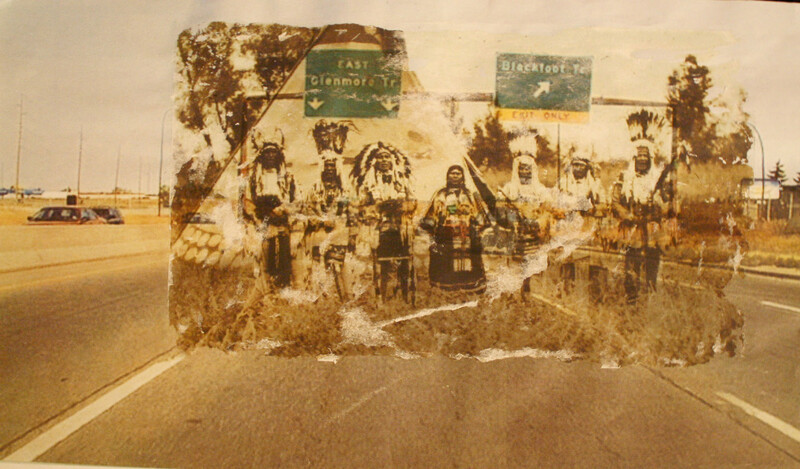 It was exhibited (and presumably sold) through Isaacs Gallery in Toronto during the 1960s. Its present location is unknown. Michael Snow was definitely at the leading edge of artists at that time and has continued to produce work of significance since the 1950s. He is now in mid-80s and his importance is acknowledged by his being named a Companion of the Order of Canada. I have previously mentioned Michael Snow in conjunction with the large Canada Geese sculpture/installation that he did for the atrium of Eaton Centre in Toronto. Anyone that has visited that building would certainly remember it. He is one of our more important artists. One that we rarely see exhibited in Western Canada. Even though it is a hunch on my part. It would seem to be a safe bet to assume that the maker or designer of this sign borrowed heavily from the central image of one of Michael Snow’s paintings or sculptures of a Walking Woman – whether they were aware of his work, or not. Notwithstanding this, the concept of seeing signage that is either unusual and/or creatively exercised is definitely appreciated in this city, as most other signage is generally safe and conservative. For this sign, it is the idea that counts. 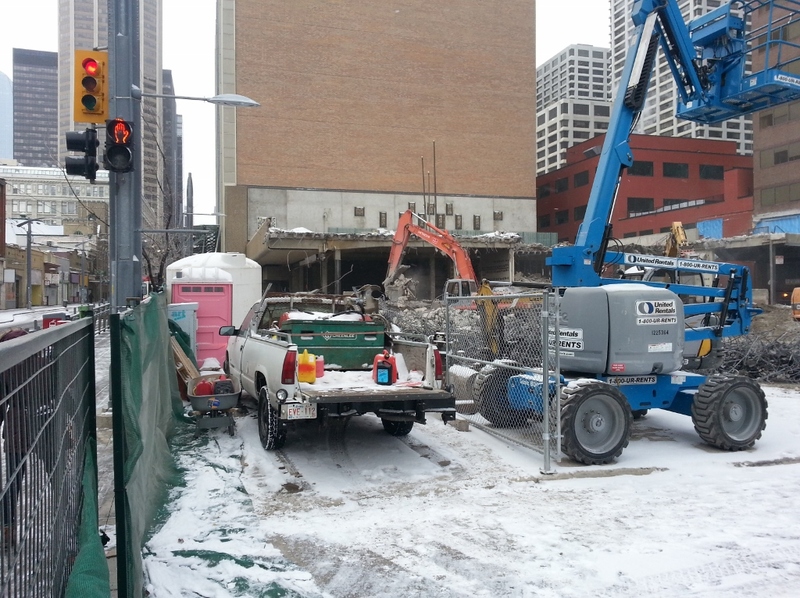 Yesterday afternoon (Sunday) after visiting my family for the holidays, I happened to be downtown and noticed that active demolition work was being performed on the site adjoining the former Art Central Building – which will soon be known as the new Telus Sky Building site. It is possible that I did not mention it, but I certainly alluded to it previously, that the external walls of the Art Central Building proper (a.k.a. 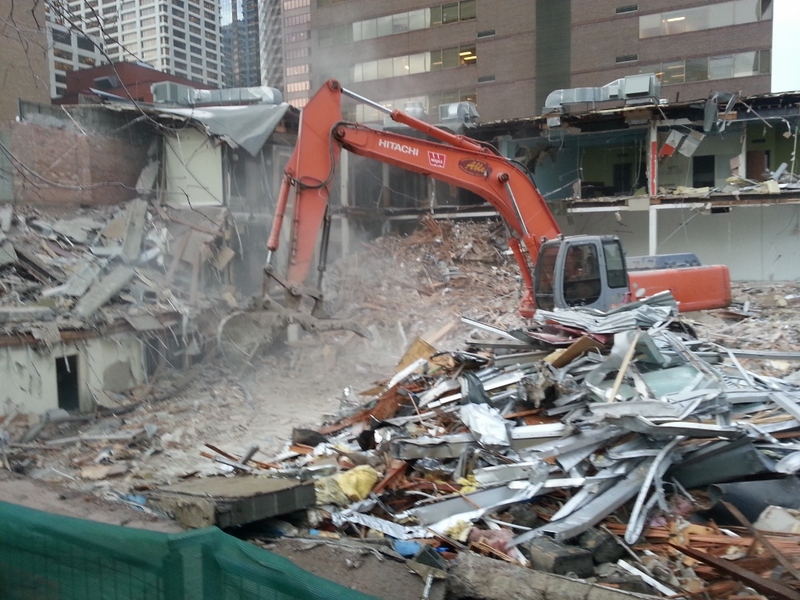 the old Jubilee Block) were fully demolished a little over a week ago. It took longer than what I originally anticipated it would take. I have also noticed demolition is more active on the weekends than it is during the week. I wish that I could say that the same thing happened when the York Hotel was being demolished when I had an active small business operating across the street from it. That is in the distant past and water under the bridge, now that my business has closed. But I digress. Now the demolition has begun to move on from the Art Central Building (which is complete) and onward to the adjoining Col. James Walker Park and single level building below. The Col. James Walker Park was little more than a flat cement surface on the +15 level that housed a small open-air fenced off playground made accessible for children who have care facilities in the neighbouring buildings connected to the +15 network. One of those nearby buildings that contains children during the workweek is the adjoining Len Werry Building. It will be incorporated into the larger Telus Sky building project. In addition to the offices located above in that building, the Len Werry Building also houses the Calgary Board of Education’s W. H. Cushing Workplace School for grades K-3. From a press release issued earlier this month, the Calgary Board of Education is now seeking a new partnership for this school. The W. H. Cushing School began operations at this location in 1995 and its current lease ends in July 2016. As a casual observer of these type of things, I would now consider it a safe assumption that if the right opportunity came along, all parties involved probably would seriously contemplate ending the lease prematurely. This is especially true given the amount of construction taking place in the immediate area both now and in the immediate future. As many will know, and I know personally from past experience, this type of activity can be highly disruptive to either a business or learning experience. The Len Werry Building has an interesting history. Part of that interesting history is surrounded in confusion. 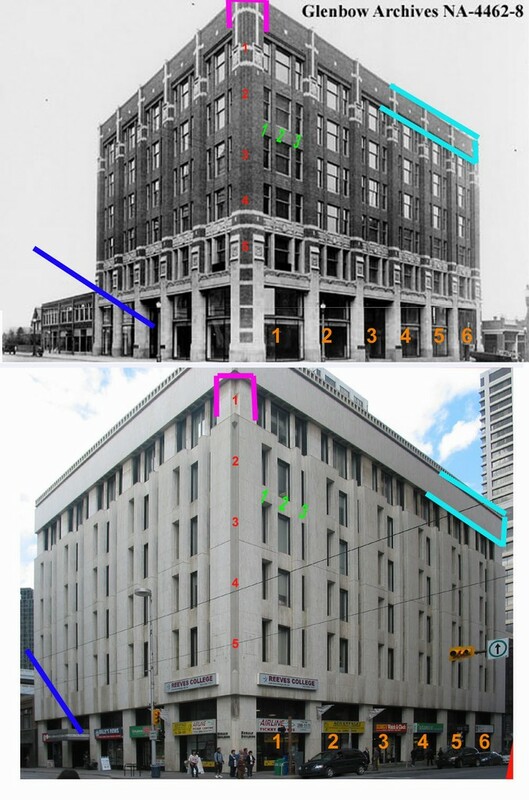 As seen in the photo above the Calgary Herald Building (built circa 1913) has a similar footprint, design and scale to the Len Werry Building. This is especially true, when one considers how the other building later occupied by the Calgary Herald was changed around the same time (see photo below). In the interim between the two buildings. The Calgary Herald Building was re-purposed and re-used as the Greyhound Bus Terminal which was its use between circa 1947-1971. We know that there was some modification at the time its use was changed to allow buses to access the interior of the building. I have seen photos of the building when it was used as a Greyhound Bus Terminal and it appears somewhat similar (at least from the exterior facing 7th Avenue and 1st Street SW) to its previous use as the Calgary Herald Building as seen above. As a result, I question how much modification was done to the exterior except where buses entered and/or left. I would expect that there probably were significant modifications to the interior to allow access for buses as well. One thing that is interesting about the repurposing of this building is that it housed Luke Lindoe’s first major public art commission (1947). We know that it was a portal relief in concrete. According to information that I have in my possession, and dates from when Luke Lindoe was still living, it is understood that this commission was destroyed. Presumably it was destroyed in the building’s demolition, prior to the Len Werry Building being built circa 1973 or 1974. In an October 1971 news story in the Calgary Herald, it was indicated that the new Len Werry Building would be 10-storeys high and cost $12-million to build. Obviously there was some changes after that time as it would appear that the current building is slightly higher as seen in the photo above. Getting back to the confusion, it increases due to the fact the Calgary Herald later occupied two buildings across the street (the former Southam Chambers Building that was re-clad with marble in the 1970s along with a smaller press building across the alley to the north, as seen in the photo above) both of which were destroyed in either 2012 or 2013. 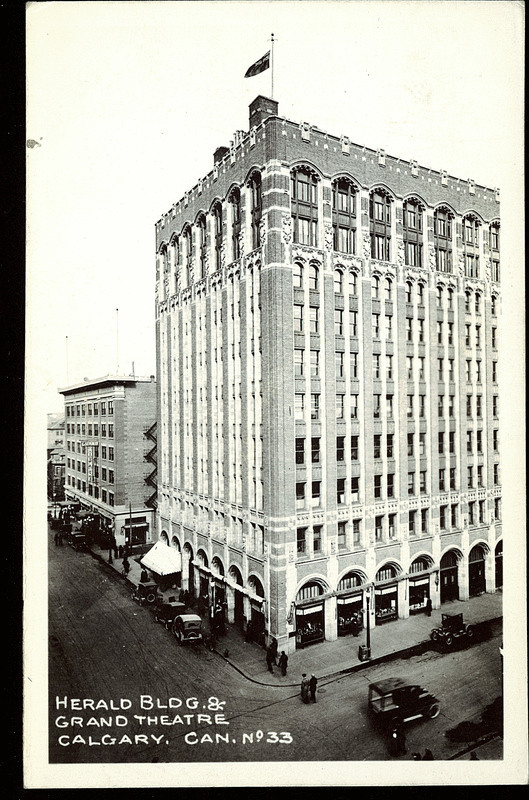 The Southam Chambers Building was built at the same time as the Calgary Herald Building, using the same architect and with the same corporate ownership. Of course anyone that knows much about the newspaper industry would know that the Southam family through their ownership of Southam Newspapers owned the Calgary Herald for a very long time including around 1912 or 1913 when the two buildings were constructed. 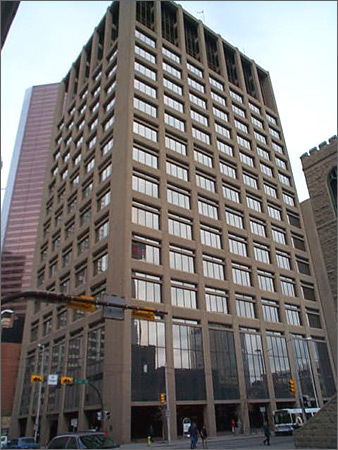 The last building that the Calgary Herald occupied downtown resided on the site of the new double-tower Brookfield Place which is now a big hole in the ground. For further reference, Christine Hayes from the Calgary Public Library back in January 2012 wrote this helpful blog post which contains a timeline and photos showing a history of the Calgary Herald and their buildings. I guess I have gone on a bit of rambling preamble to the main point of my current post – the terra cotta gargoyles created by English stone carver connected to the Royal Doulton China company, Mark V. Marshall [1879-1912]. Marshall was commissioned by the Southam family to produce these gargoyles I want to talk about further. To do this properly, we must go back to the period around 1912. In what was still essentially a frontier town, the population in the City of Calgary had only reached 47,000 at the population height during 1912. It was a time when the city was undergoing rapid growth as evidenced by the formation of the 100,000 Club which anticipated that the population would reach that number by 1915. It was also the year that the Calgary Stampede was recreated in its modern form throwing off the shackles of its Agricultural Fair past dating back to 1886. It was also a time when the focus started in creating a ‘world-class city’ a discussion which continues to the present day. In that context, there were a couple ideas percolating in the city. One of these was the establishment of public art (a topic that I have written about previously, I probably will write about again, and what I want to talk about now). I previously have discussed the reproduction of Auguste Kiss’ sculpture Mounted Amazon Attacked by a Panther that was installed in Central Memorial Park (which is still presumed missing); along with Louis Philippe Hébert’s heroic-scaled equestrian commissioned sculpture of an anonymous cavalry officer to commemorate the Boer War which was intended to be paid for by a group led by Major Stanley Jones, but in the end was largely paid for by the City due to unfortunate timing of WWI and drought in the area. Both of these sculptures can make reasonable claims for being the first piece of publicly-situated sculptures in the City. In the Wikipedia entry that talks about the Hébert sculpture, makes this fabulous claim, “the statue is one and a half times life size, and has been described as one of the four finest equestrian statues in the world.” Although that last part sounds rather intriguing to ponder, interestingly there is no note attributing the source attached. It is a high standard that is claimed, so I would be rather curious to know how the ranking was determined; and what methodology was used to do so. There are some other comments in the same entry that also made me raise an eyebrow as well. To my mind, all these claims as a whole, suggest to me that whomever wrote this part of the entry must be prone to engaging in a bit of world-class thinking, but I digress. All that from trying to remember what the artist’s first name was. The third public art project in the 1911-1914 period was the gargoyles which I mentioned briefly above. In the photo at the top of this post which shows the active demolition of the Col. James Walker Park and the one-storey building below shows a series of visible gargoyles. In the summer of 2013, knowing the ultimate destiny of this park given the news release announcing the Telus Sky development plans, I took photos of the Col. James Walker Park while it was still accessible to the public. Here is a photo of the gargoyles which are attached to the Len Werry Building at that time. In the photo at the top of this post, they still appear to be there. These gargoyles are interesting in themselves, but also are a source of some speculation as well. Several people have expressed dismay that the ancient facing had to be eliminated along with the little gargoyles which decorate the front and side of the building. The fact of the matter was that the old facing of brick and terra cotta had become so weather-beaten and had degenerated so badly that it had become a very considerable hazard. Several pieces, up to the size of a football, have actually dropped off the building in the last two or three years, endangering passers-by below. So it would seem likely to assume that all the gargoyles were removed from both buildings in the 1966-1972 time period. Whether they were all saved is another question altogether. Regardless of the ultimate destiny of all the gargoyles, we do know that some gargoyles have been saved. The January 11, 1973 issue of the Calgary Herald published a photo of two of the gargoyles (see Glenbow Archives photo NA-2864-22325 below). 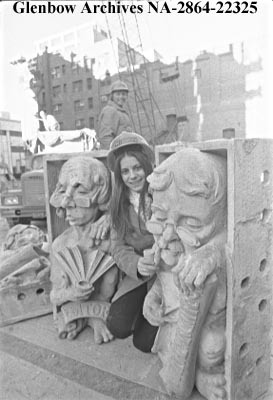 Carole Garroni, a Calgary Herald newspaper employee, pictured with gargoyles that were removed from the old downtown Greyhound building before it was demolished. The building had once been the home of the Herald newspaper and the gargoyles were caricatures depicting the employees. They were made in England by Royal Doulton. The removal of the Greyhound building made way for the development of a new Alberta Government Telephones building. One of the two photographed gargoyles, the theatre critic is currently adhered to the wall of the Len Werry Building as seen below. The editor which is the other featured figure in this photo may potentially still be located in the lobby of the Len Werry Building. However, there is still a similar figure, the stenographer which is affixed to the wall like the theatre critic. We know that there are approximately ten gargoyles (including some ornamental embellishments, which I am going to assume came from one of the two buildings) that have been incorporated into the sandstone exterior of the Alberta Hotel Building at the corner of 8th Avenue and 1st Street SW. These were added at some point after 1973. When the building was demolished there was a large public outcry about their destiny. Regardless of the outcry, only 240 of the gargoyles were saved. The City of Calgary owns 46 of them. The Glenbow owns a few of the larger gargoyles as well. In addition there are a few which are located in the Science B Building at the University of Calgary as well and in the Convention Centre. I am sure that there are probably a few others that I am not aware of. In talking to Frank Hall in the past, I understand that some of them were dispersed through his auction house in the 1970s. 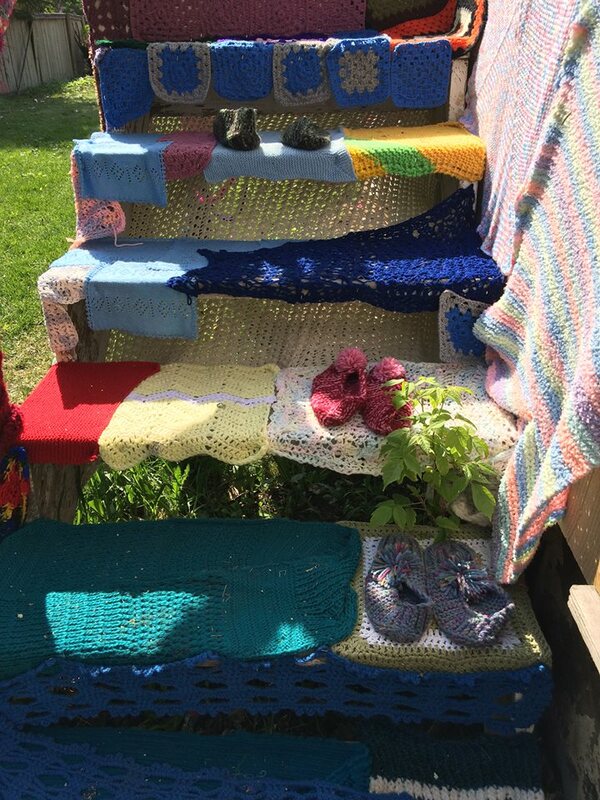 They were sold by the City with the proceeds to fund the Historical Preservation Fund for heritage projects. Periodically they still appear. Recently one appeared on eBay and was the subject of a 2007 news story. And as seen in the photo I took in the summer of 2013 something like 23 are located on the wall of the Len Werry Building at the Col. James Walker Park. For now the 23 gargoyles are still safe – barely. Although it would appear as if their destiny may very well be the landfill in the very near future, unless some backhoe operator takes compassion upon them. Personally, having witnessed this sort of thing before, I have very little faith in this happening. The other alternative to their rescue is if someone rallies the cause and draws attention to their potential demise – just like the careers of those who are portrayed on that wall – the theatre critic, the stenographer, the typesetter, B.S.S. the Devil, the Other Architect, and the cleaner that is a union member. Then there is this mural from the students from the W.H. Cushing Workplace School which is still located in the Col. James Walker Park as well. The students who created this would be in high school now, maybe in university. They have probably forgotten about this project that probably mentions Y2K, as have their parents. This past Friday I wandered through Eighth Avenue Place. For those that don’t know it is one of the more recent buildings to be built in the city. It is a two tower building with interesting architecture (for those that consider a giant glass box interesting). What makes it so, is the top which is intended to allude to mountain peaks. The first tower (east tower) opened probably three or four years ago and the west tower was officially opened this past October 16th, if I recall correctly what one of the security guards told me when I asked a few weeks ago when I first noticed new art being placed on the walls. As I have probably mentioned previously, the building contains a well-selected collection of art that is visibly displayed in the lobby. In my opinion, and I realize it is a judgement call on my part, it is one of the better publicly viewable collections in an office lobby in the downtown core. Most office buildings in the downtown core have little, if any, publicly viewable art and when it is, it is more often than not – a single piece of sculpture. So it is not that difficult of a judgement to make. The collection that has been accumulated so far is generally focused on Ontario, Quebec and BC art from the mid-century period. From the perspective of someone who has dealt in art for most of his adult life, I would suggest that the works selected are a good base to build a collection upon for someone looking at a modernist collection. So whomever the art advisor(s) they have used, deserves kudos on their choices. I am going to make an unsolicited recommendation, and I understand that it will probably have little (if any) bearing upon the outcome. My recommendation is that I would strongly suggest acquiring a work by Rita Letendre for that space. 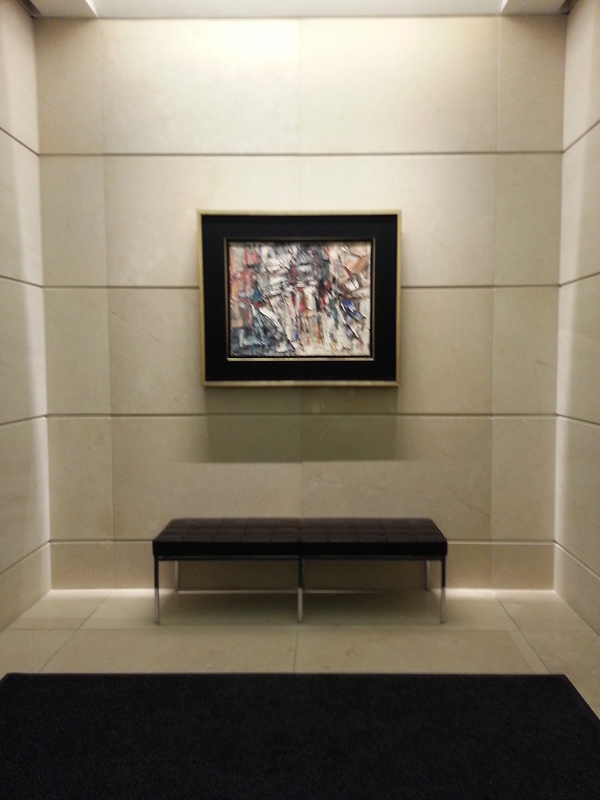 In the entire lobby ALL but ONE of the works selected and installed so far, have been created by white, male artists. 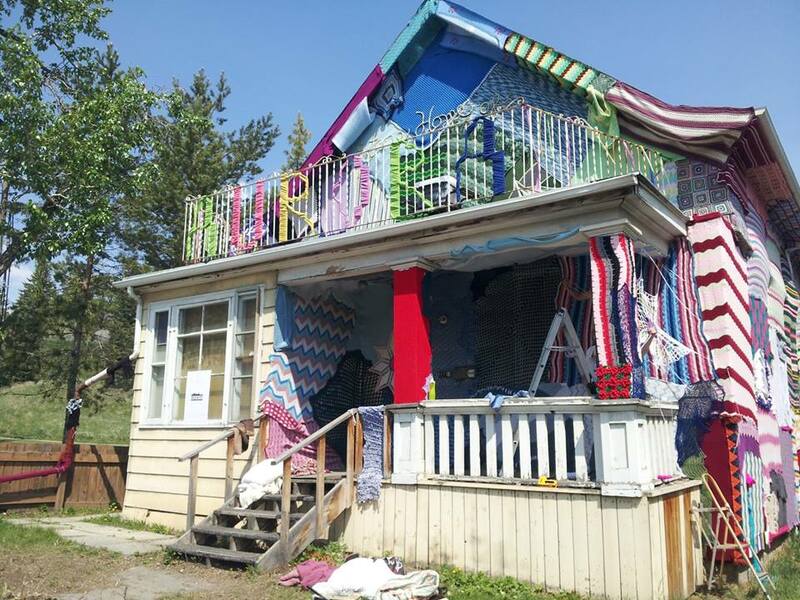 However the ONE exception is created by a token female artist – Marcelle Ferron. To select another female artist will help remedy this gender imbalance, and will reflect better upon the significant amount of practising artists that are female both living and deceased during the Canadian post-WWII period through to the end of the 20th century that the works selected for the building belong. Not only was Rita Letendre a woman who held her own in a period of predominately male-centric dominance in the visual arts; she also won major non-gender specific awards in international shows and competitions; and received major commissions at the same time. One of these, the 1964 commission she completed at California State College, Long Beach prompted to move her work into a completely new direction away from the abstract-expressionist influenced work that riffed off work by major artists such as Franz Kline, Clyfford Still and highly influential, but under-rated Canadian/Québécois artist Paul-Émile Bordous (who in my mind should be included as well). As an aside, before I go any further, I should explain why I made the statement about “male-centric dominance” in the last paragraph. I expect that someone will take exception to my comments. By stating what I did, I mean the period of time prior to 1985, which to my mind is important in this context of work being exhibited. This year of 1985, can be considered a benchmark year to mark when change to the status quo began. It was defined by the Guerilla Girls and the year that this group was formed. Through their vocal feminist activism and as a result of their fomentation, they were subsequently able to draw attention to the gender imbalance in New York City museums and their exhibitions at that time. This resulted in the desired effect of increased influence on future dealings with female artists and opened many doors that were previously closed to them, even though there were artists such Joyce Wieland, Emily Carr, Frida Kahlo, Georgia O’Keefe, Jean Sutherland Boggs and others who were not fully constrained by gender barriers during that male-centric time. Like Marcelle Ferron, Letendre was closely aligned with the group of artists in Quebec (Riopelle, Barbeau, Ferron, in particular; and McEwan to a lesser extent) that have been previously selected and installed in this building. She also has a connection to Toronto and its artists (such as the Painters 11 members Bush, Mead and Ronald) through her long-standing relationship with Kosso Eloul. Many in Calgary will be familiar with Eloul’s work from the elegantly simple and muscular sculpture standing in front of the former Nova Building (now the Nexen Building) only two blocks away from Eighth Avenue Place which is visible from the C-Train tracks. In addition to that, Letendre is of aboriginal descent. So to give a major work of hers pride of place, is probably a smart idea. As any person working in the resource extraction area in Calgary will know, there is a significant amount of oil and gas exploration by Calgary based companies, and pipelines that cross aboriginal communities. Many larger companies will have specialists who deal with aboriginal relationships. In addition, there is a significant amount of potential resulting controversy that goes with these ongoing relationships (think Enbridge Northern Gateway pipeline project, the Lubicon Cree protest of The Spirit Sings exhibition at the Glenbow and more). Any person who reads or follows recent news will know that aboriginal issues are topical and in some cases need to be addressed. 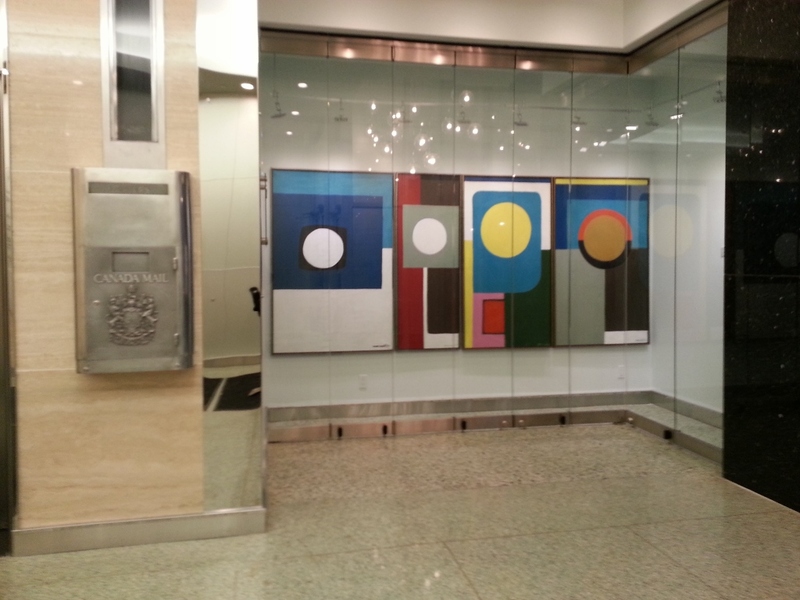 So the fact that there is very little (if any) art on display in lobbies of Calgary office towers by aboriginal artists of note (and there are many) is extremely surprising. Personally I find this oversight somewhat shocking given this knowledge stated above. But I digress. But what do I know. I am just an observer of this sort of detail – a direct result of dealing in Canadian art from pre-Confederation to present day for close to two decades. However, if someone reads this and wants a knowledgeable art consultant for a corporate collection that is more than just a one trick pony (like many art consultants and designers) – send me an email and let’s talk. I wasn’t elected as the chair of the civic art collection committee for a number of years without a reason. It would also give me a reason to do something that engages my interest and passion more than the predominately mindless retail banter I am currently engaged in daily which I expect to get laid-off from in exactly eleven days (immediately following Boxing Day, or of I am fortunate have my employment extended until New Year’s Eve). On a related side note, I should give a quick shout-out to Brittney Bear Hat and the work of hers that was recently installed on a billboard near the intersection of Glenmore and Blackfoot Trails (see photo above). This work is part of the current iteration of the Calgary Biennial which began a few weeks ago and will continue through to February or March 2015. This is the type of dialogue I would expect to see more of in this city – a dialogue which should be encouraged and supported by both industry and the public at large. This is particularly true and desirable given the close working relationship between oil & gas exploration and current aboriginal issues. I may talk about either this work and/or the Calgary Biennial at a later time. It all depends on my available time personally to do so. Of note, given this context, I should also draw attention to the recent four-day long Stronger than Stone: (Re)Inventing the Indigenous Monument conference which was held late last month at Alberta College of Art and Design and at Saskatoon’s Mendel Art Gallery. Ironically, this long-winded deviation was not the reason (or intent) for why I started this post. But now that it has been written, I somewhat like it, and now would like to keep it. Initially, it was my intention to write about Jack Bush. I guess I got distracted and got off on to a rambling tangent. Something I am prone to do from time to time. I guess I will have to finish the Jack Bush posting later. I will plan to do it after work this evening, although I know in advance that it will be a very long day of work (probably close to16 hours) for me including outside of the retail job I mentioned earlier, I also will be doing an art install in the regional offices of one the big five Canadian banks later this morning. So it probably won’t help that I was up at 4:00am to write this. I may as a result take an extra few days to do so. Regardless of which artist is selected for this last remaining space, I am sure that it will be well-selected as have the other works in the past. Doing a very quick update on the Art Central demolition. The photo above was taken near the corner of 7th Avenue and Centre Street around 4:00pm earlier today (November 25). As seen here the basement floor is visible and there is not much left to the building, except the north wall facing the alley where the Brunning mural is located. 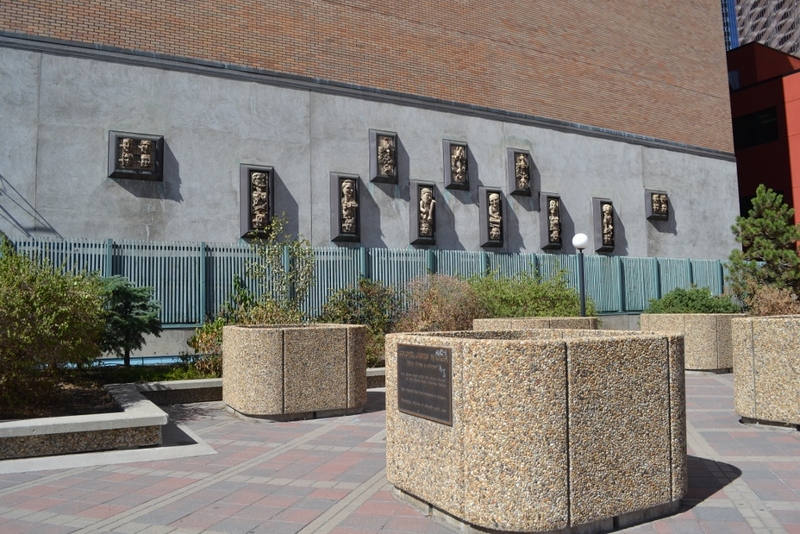 There is also a bit of the west wall still standing which abuts the Col. James Walker Park, which is located on the +15 level between Art Central and the Len Werry Building at the other end of the C-Train platform. 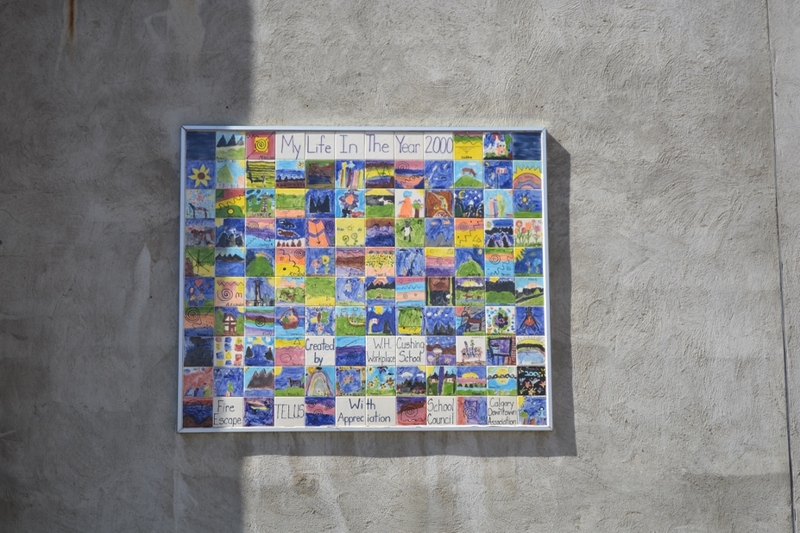 There is some public art located on the Col. James Walker Park affixed to the Len Werry Building. I suspect that I will write about it in the near future. With it only being Tuesday evening, I suspect that the north wall facing the alley will be demolished by the weekend if they keep up this pace.